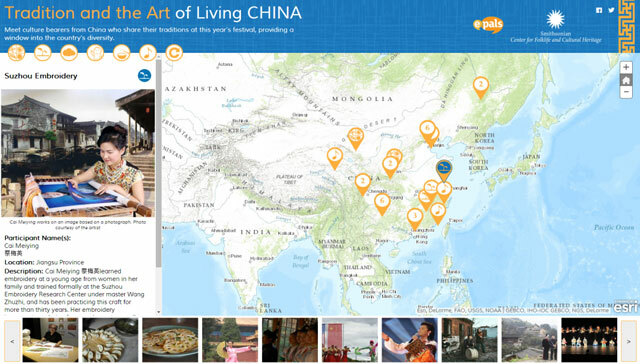 The second in a series of story maps for the Smithsonian Center for Folklife and Cultural Heritage, Tradition and the Art of Living China highlights the culture bearers appearing at the 2014 Folklife Festival in Washington D.C. Built by Blue Raster and Cricket Media, the map allows users to experience the artistry and heritage of those keeping China’s diverse traditions alive. Although the map has since been removed from the web, it was created using ArcGIS Online. The story map integrates photographs of the Folklife Festival participants and their work. As a result, it offers a comprehensive look into the cultural heritage of China. From calligraphy and pottery, to martial arts, users worldwide can explore the unique stories of these tradition bearers.